In October 2018, PwC joined eight other companies and the National Organization on Disability in launching the Look Closer campaign, a national awareness effort aimed at promoting Americans with disabilities as an untapped talent pool for U.S. businesses. Although this important campaign has been in the works for more than a year, my interest in making the business world a better place for individuals with disabilities started a long time ago. 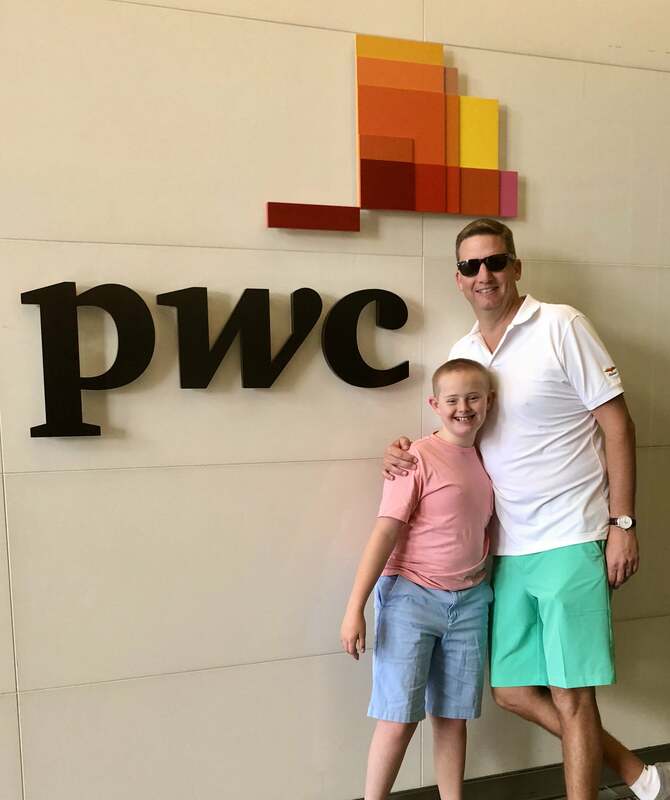 Brad Hopton and son Braden pose in front of PwC's London office. When I began my career, I could never have predicted I would have such a passion for this topic, let alone be at the front of a campaign promoting it. After college I began working at PwC’s Cincinnati office. Work was, in large part, my life at that time. I made a lot of sacrifices and began to move up the corporate ladder. A promotion and related transfer brought my family to New Jersey and my wife, two daughters and I were thrilled. Life was good. When my wife got pregnant again, there were no signs of any problems at her check-ups and we assumed everything would go the way it had with the births of our two daughters. But this time, we were having a son. And shortly thereafter we learned that he had a disability. My son Braden has Down syndrome. A few days after Braden was born, I remember sitting in the hospital with my head in my hands, distraught at the realization that my whole world had flipped upside down in an instant. I wasn’t sure what to tell my family, my friends, or my co-workers — What will this mean for me and my family? How will this affect my career? How will I ever be able to take care of a son with a disability, especially when so much of my focus is at work? After another week or so, at around 2:30 AM during an early morning feeding, I was sitting in the NICU looking at Braden struggling to breathe when my world shifted once again. This awesome little boy, only days old, was fighting for his life, fighting with every ounce of his being just to breathe. And I realized in that moment that my life, my view of the world and my career, had to change. It definitely wasn’t just about me anymore. This early morning epiphany was a true turning point. Braden transformed me and my family, and is my inspiration now to help PwC and the business world realize the extraordinary impact that people with disabilities can have. Thirteen years later, Braden is doing really well and I now have a drastically different perspective on life and my career at PwC. Braden inspires me each and every day, teaching me how to be a more compassionate and patient partner, reinforcing the essential benefits of work/life balance, and expecting me to be a better leader for all of our people. Rather than inhibiting my career, these realizations have clearly enhanced it. I’m so fortunate and proud to work at such an amazing firm with such amazing clients. And now I have the opportunity to give back and continue to help PwC drive to even greater heights in connection with our inclusion efforts for people with disabilities. I admit that I’m obsessed with getting the best talent at PwC and I firmly believe that means seeking out people with disabilities. It isn’t just about giving them a fair chance to be contributing members of society, which is very important. It’s more than that — This is about talent and being able to offer the best talent to our clients, which is a business imperative for us. When we bring in people who are differently abled, we’ve found that it helps us solve important problems in creative and different ways. To me that’s diversity, that’s innovation and that’s what good business is all about. So that brings us back to the Look Closer campaign. Having been an internal champion for disability inclusion for years, I’ve heard every question and every concern that employers might ask. I’ve heard every misconception. This is why an awareness campaign is so important: to broadly question conventional thinking, and honestly explore the (real, not imagined) opportunities and challenges of hiring and supporting employees with disabilities. It’s about enhancing that dialogue with a group of forward-thinking, global companies with the common goal of advancing the hiring and retention of people with disabilities. It is about putting Americans to work, at a time when talent is at a premium. I am so proud that PwC has gotten behind these types of important initiatives at a national level, and proud to be aligned with leaders like NOD and our other corporate partners: Anthem, ConantLeadership, DiversityInc, EY, The Hershey Company, Prudential, Spectrum, and UPS. We’ve made a lot of progress in disability inclusion as a society, and as individual companies, but we still have a ways to go. We at PwC believe we can all go farther together. So I encourage anyone and everyone to visit our campaign website at www.nod.org/lookcloser, and whether you’re a person with a disability, an ally, or just interested in learning more, consider getting involved with this important effort. You’ll find means of doing so on the website above. It’s time we looked closer at talent in the 21st century — I hope you’ll join us.